We'd been hearing about this desert city full of Mid-Century Modern architecture for years. But it's difficult to comprehend until you actually experience that cool-building-on-every-corner aspect of Palm Springs, California. The celebrities who frequented this city in the Forties, Fifties and Sixties built cutting-edge homes to use as their Winter retreats. Today this city of approximately 45,000 is awash in well preserved examples of Streamline Moderne, International, Brutalist and Postmodern architecture. And fortunately for us the civic leaders appear to understand the power of architecture as a tourist attraction. Preservation has saved many important buildings, and many commercial structures are protected from any visual alterations or possible "remuddle" jobs. New construction also leverages the modern look by incorporating classic Fifties styling cues like a butterfly roof or aluminum brise-soleil. If you love modern architecture you'll enjoy visiting Palm Springs. Unless it's August. 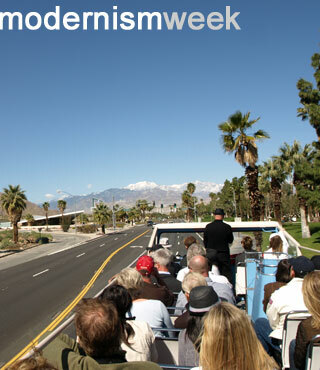 That's why Modernism Week, held each February since 2006, is a perfect time to make that jaunt to the Coachella Valley. You'll find a week and a half of cocktail parties, gallery openings, car shows, home tours and a convention center full of cool furnishings for sale. The show & sale is held the first weekend of Modernism Week, and is actually the event that started it all. Vendors from all over bring new and used furniture, artwork, jewelry, posters and more to tempt your modern tastes. Architectural tours from an authentic British double-decker bus. Gary Johns (above) narrated our tour of the finest example of residential and commercial architecture Palm Springs. The highlight of this highlight: noted architect Don Wexler was on board with our group! An exhibition of classic travel trailers- and not all of them were Airstreams either. There were a couple of the classic Spartan trailers, made in Tulsa at the Spartan Aircraft factory! Uptown gallery hopping on Friday night- which was understated in the official program as only three shops- turned out to be half the storefronts lining the main drag of Palm Springs! Another great street event is the city's Village Fest held on Thursday evenings. The display of Braniff uniforms and memorabilia was also impressive. In addition to the 30-plus year collection of air hostess uniforms, there were some great ephemera and a video loop of classic Braniff commercials. This was especially interesting for us since Braniff had such strong ties to this part of the country-- their first route was between Oklahoma City and Tulsa. Charles Phoenix and his slideshow was a riot. He has collected vintage slides from yard sales and adoring fans to create his Retro Americana Road Trip. Now here's a few photos from our trip. Enjoy! Sounds awesome! Did you get to see Sinatra's house? I am hoping to make it to Palm Springs on one of our upcoming L.A. trips. We only saw it from the bus. Oh, by the way... don't screw around if you want to go on the home tours! They fill up fast. Fortunately you can purchase tickets online in advance and the volunteers do a great job keeping everything straight. You've reinforced my desire to go out there - do you know the dates for next year's show? Hi Rex. Loved the Braniff video. Do you know anything about the story surrounding the pink hair/bubble photo? I was a hostess and someone got very creative with that. We couldn't, of course, have gotten away with that back then, albeit we were quite progressive in our style! Hi, Rex...do you know the story behind the pink hair/bubble photo. We would never have been allowed "pink" hair, albeit we were very progressive in our style back then! Love the video! I don't think they were suggesting it was historically accurate.